Studio version of "You're My Home" featuring photos of actress Kay Lenz from the movie "Breezy." But that's all right my love 'cause you're my home. Billy again delves into country-pop with the ballad "You're My Home." Musically, it's a pleasant enough tune, and thematically it's a nice sentiment, that your lover is your "home." But there are some awkward lyrics here like "use my body for your bed," "when I feel my withered roots begin to grow" and the cringe-inducing "instant pleasure dome." Still it's a lovely song, sounding a bit like the late Jim Croce (see "I Got A Name" or "Time In A Bottle") and Gordon Lightfoot (see "The Last Time I Saw Her Face"). I'm surprised no country artist ever covered this song like Dolly Parton covered "Travelin' Prayer" and Garth Brooks covered "Shameless" from 1989's Storm Front. However, 1970s pop icon Helen Reddy did record and perform the song on The Midnight Special in which Billy Joel himself appeared and performed "Travelin' Prayer" and "The Ballad of Billy The Kid." Billy or his people later asked Ms. Reddy to stop performing the song as they did not like her version. At that time, Reddy was a big star, so it took some chutzpah to tell her to not record or perform it. Billy tells the story in the video below (right, bottom) n 2015 in his usual humorous and sarcastic fashion. He also talks about being inspired by Gordon Lightfoot. Billy recorded a live version (right) for 1981's Songs In The Attic and a live version also appears on the 12 Gardens bonus CD. In the liner notes for Songs In The Attic, Billy explains that he wrote the song as a Valentine's Day gift for his then wife, Elizabeth. Billy talks about the song on SiriusXM radio. ​Click the audio player above to listen. The homemade video above (top) features photos from the 1973 movie Breezy (YouTube) starring Kay Lenz and William Holden. The movie always reminded me of the song and vice-versa. Lenz plays the quintessential 1970's California hippie lady in the movie, the kind of person that inspired Elton John's "Tiny Dancer" (YouTube) ("blue jean baby, LA lady"). Clint Eastwood directed the movie and has a brief cameo appearance. 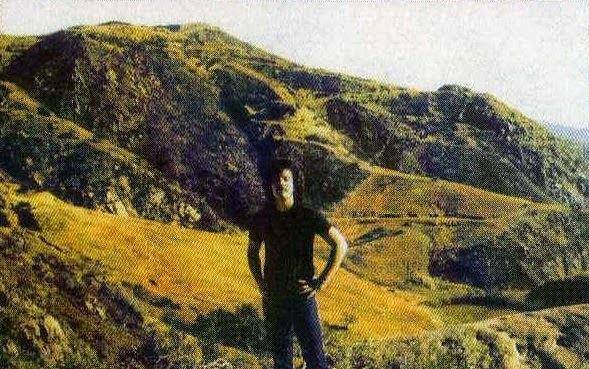 "High up in the hills of California . . . "
"You're My Home" at Sparks in 1981. ​Official video from the Songs In The Attic album. Billy talks about Helen Reddy's cover of the song from The New Yorker Festival in 2015.